Trampoline Socks: Should You Wear Them? Trampolines are not just for kids. The Stamina 36 inch Folding Trampoline is perfect for adult workouts. Studies have indicated that jumping on a trampoline increases blood flow, helps the immune system and the entire lymphatic system. Rebound training using a personal trampoline has many documented benefits. Workouts do not have to be drudgery. There are plenty of adults that are jumping for good health. The Stamina 36 inch Folding Trampoline is a favorite of many people that swear by using a trampoline to get their aerobic exercise done. Why not have fun while you trim down and enjoy good health? Like most people, you have probably had your share of faux pas with exercise equipment that becomes storage for your clothing. Big machines take up big space, so they often have to double as a catch-all and a place to hang things. The Stamina 36 inch Folding Trampoline can easily slide under the bed when not in use. This is a big selling point for many apartment dwellers and people that just do not want to give up their floor space to the equipment. The thirty-six band tension support offers a great taut bouncing service. Each band is a full two inches wide for added durability and stability. The bands are only a part of the great construction features that make this an outstanding product choice. This well-constructed personal trampoline is ideal for rebound training. Get further details and buy now on Amazon.com. Rebound training using the Stamina 36 Inch Folding Trampoline is ideal for all fitness levels. The taut bouncing surface allows you to set the pace of the workout. You can train at your pace. The durable construction is a huge safety factor for those that are new to the rebound training programs. 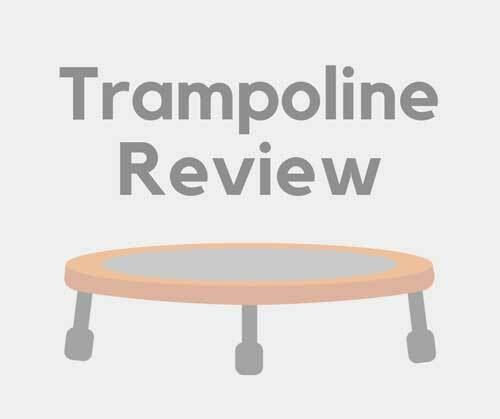 Reviewers love this trampoline. Most reviewers are very happy with the ease of assembly and with folding up for storage, but the reduced score is largely relative to the handful of people that had difficulty with the assembly and folding. Even the reviewers that struggled with the assembly had to concede that this is a great trampoline and in all fairness the directions do suggest using two people for the assembly to help stretch the bouncing surface on the trampoline. Ultimately following the directions could pay off with less frustration in assembling the unit. Almost every stamina 36 inch trampoline review had something positive to say about this trampoline which makes it one of the most highly recommended models for rebound training. If you are ready to get healthy and want to enjoy it than the Stamina 36 Inch Folding Trampoline is the one piece of workout equipment that you will use. It has all the features that are tops on everyone’s list. It is a good purchase. Trampolinegurus.com is a participant in the Amazon Services LLC Associates Program, an affiliate advertising program designed to provide a means for sites to earn advertising fees by advertising and linking to Amazon.com. Amazon, the Amazon logo, AmazonSupply, and the AmazonSupply logo are trademarks of Amazon.com, Inc. or its affiliates.